Who doesn't love a sale. Especially one that offers so many options for transitional pieces for Spring. Since I am coming to an end of my pregnancy, I thought I would treat myself with some pieces that can be worn both postpartum and easily into the Spring weather. 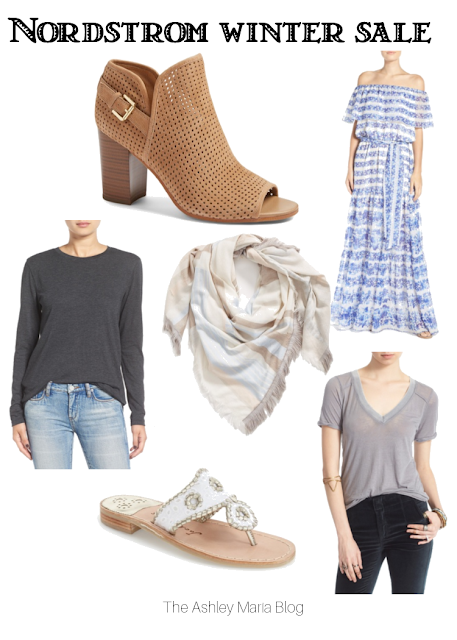 Check out some of the looks I'm crushing on from the Nordstrom sale! These open toe booties are the perfect transition to show off your newly pedicured toes! Raise your hand it your tired of wearing closed toe shoes! I love the look of this maxi dress! I tried on a similar free people dress but like this one much better with the off the shoulder look. It's perfect to throw on and I have a feeling this spring that will be my signature look 'easy to just throw on'! I can not say enough things about these long sleeve tee's. I have them in every color and wore them all throughout my pregnancy also. They are on also for around $11 now! How can you pass them up! This scarves colors are perfect for a transitional piece. you can add it to a basic white tee and denim jacket or over a dress with boots. it's 50% off right now too. The most comfortable tee's and right here. I again wore these pregnant. Last but not least is these Jack Rodgers sandals! Every girl needs a pair in her closet. You can dress them down with shorts or up with a dress. The white eyelet are so classic and can be worn with everything. Do you have any favorite pieces from the sale? Did you purchase anything yet?